We who are born of Heaven are not working on our own. We are co-laborers with Christ. 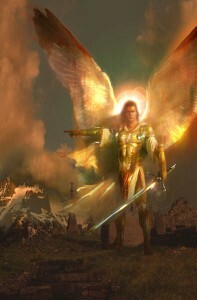 We have a myriad of angels working on our behalf, ministering in our lives according to God’s perfect will. There is so much going on “behind the scenes” that it would make our heads spin. In the spiritual realm there is no inactivity, no sleeping, it is always moving and things are being accomplished every second. Satan knows that his time is short, so the battle that is being wages is massive. Sometimes I wish that I could be like Elijah’s servant and see “those that are for us” who outnumber those who are against us. Remember only one third of the angels fell, which means there are twice as much for us as are against us. We are at war; we are soldiers of the Most High. What are we fighting, laboring for? God handcrafted us as a master artist, to do good works. Every gift and talent that He placed within us is to further His Kingdom, to bring Heaven to earth. He has so much love that He isn’t satisfied with a small family, He wants a huge family. Our job is to bring them in. I got to thinking about that, after I cried for about ten minutes. That’s how I feel sometimes when I see how bad the world around me is, when I feel like there are so many who don’t know God. I have asked myself, “how can we ever reach so many”, or “what can I do, I am just one person?” But, if we all have that same attitude as the older guard, each one reach one, our churches would be full! I am not responsible to save the world. Jesus already did. I just have to take one person at a time and let them know that this war is already one. Tell them, and more importantly show them the love of God. His goodness turns hearts to repentance. Those angels I was talking about are working on them, the Holy Spirit is brooding over their hearts preparing them to receive, and Jesus is wooing them. Yes, there is work for us to do. Spiritual and physical, we need to witness and clean the toilets. We need to feed the hungry and change diapers. All done for God, all as co-laborers with Him, and it will all glorify Him. We are not spinning our wheels, if we are led by His Spirit, though it may seem that we aren’t accomplishing much in the natural, our labor is not wasted or futile! So, keep working. Take one day at a time, but look at each one and each opportunity in the light of eternity. Always remember, there are more for us than against us!